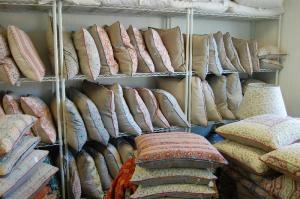 Our pillows are made with Unique fabrics from India and Europe ranging from the late 19th century to modern day. 100% Cotton India Hand Block Print Fabrics are bought in small quantities and are the specialty of the house. These beautiful and colorful fabrics come in wonderful patterns such as paisleys, hand blocked stripes, clovers and other assorted designs. Fabrics are limited in quantities and are rarely able to be repeated. Each fabric usually yields 4 to 6 pillows. A constant supply of unique fresh prints arrives directly from India allowing for a great variety in choice of patterns and colors. All pillows come with a 100% new linen or 100% new linen/cotton neutral back and feather/down insert. A zipper opening is at the bottom of each cover allowing for easy removal. Other areas of concentration are 1960s to 1980s India hand block prints that are quite rare as well as late 1800s to early 1900s French ticking and prints. Some of the vintage fabrics may have small spots that have become part of the essence of the overall look. We love this. Fabrics are treated to a Special Technique that has taken years to perfect. This technique enhances the look and appeal of each pillow, even if from the same pattern. The individual pillow takes on its own personality and is simply a joy to look at. All fabrics are pre-washed and processed. For best care covers can be machine washed in cold water (except where noted) - gentle cycle and dried at medium heat setting in the dryer. Because of the nature of the vegetable dyes in India block print fabric, machine washing tends to fade patterns and colors over time. This results in your pillows taking on a wonderful worn and beautiful look. We also love this. Dry cleaning is another option. (This is especially good if you want pillows to retain their original look). Although Pillows are my main focus I cannot resist a great item when I see it. "And etc" are some of the wonderful pieces I have come across during my travels and perusing over the years.